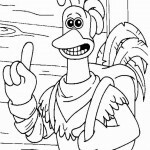 Welcome to our Chicken Run coloring pages. 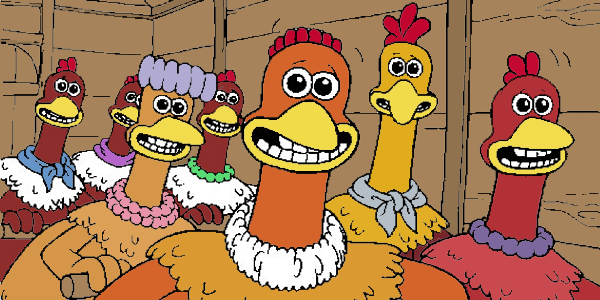 Chicken Run is a 2000 British stop-motion animation film made by the Aardman Animations studios, the production studio of the Oscar-winning Wallace and Gromit films. 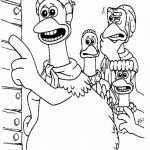 Set in Yorkshire, England in 1959, the film centers around a band of chickens, who seek a smooth-talking Rhode Island Red named Rocky as their only hope to escape from their certain death when the owners of their farm decide to move from selling eggs to selling chicken pies. 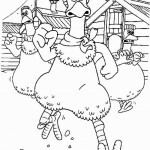 You can visit this farm in our Chicken Run coloring pages. 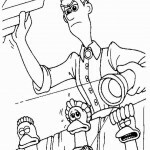 The Tweedys are a grumpy middle-aged couple who run a chicken farm in Yorkshire, England, in the manner of a World War II extermination camp. 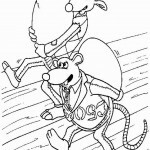 One chicken, Ginger, continually tries to get the chickens (including her best friends Babs (who loves knitting) and Bunty) to escape from the coop using various plans and contraband obtained from two rats, Nick and Fetcher. 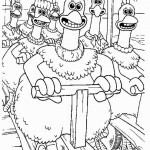 All of these chicken and the rats can be colored in our Chicken Run coloring pages. The efforts at escape sometimes involve going under the fence. 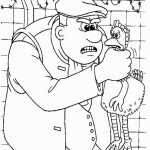 But Ginger is always caught by Mr. Tweedy and his dogs, and while she is kept in solitary confinement in the Coal shed, she comes to realize their only hope of escape is to go over the coop’s fence. 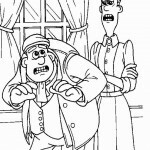 After Mrs. Tweedy finds out that Edwina has laid no eggs, Mrs. Tweedy kills her with a hatchet. 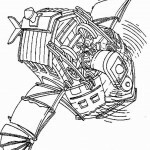 Ginger tells Nick and Fetcher to find parts for a catapult, but Nick and Fetcher want her to give them eggs in exchange. 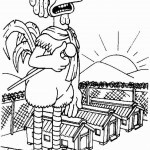 Mrs. Tweedy, struggling to keep the farm financially viable on dwindling egg production (” I’m sick and tired of making minuscule profits”), notices a magazine advertising poultry products; she decides to convert the farm from egg production to chicken pies, and orders a giant pie-making machine. 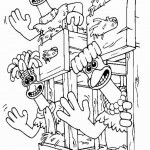 Mr. Tweedy believes the chickens are organizing a big escape, but Mrs. Tweedy dismisses the idea as a ridiculous notion and does so in a rude, domineering manner. 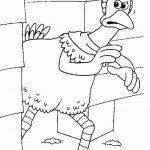 While the Tweedys await delivery, Ginger tries to keep the chickens’ hopes up, but Bunty, a champion egg layer, says that their chances of escaping are a million to one. 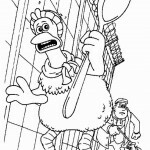 To this, Ginger responds, “Then there’s still a chance.” In our Chicken Run coloring pages you can see if the chicken can escape the farm. 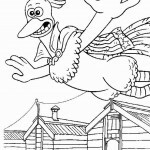 Now that you’re done reading it’s time to scroll down to our Chicken Run coloring pages!